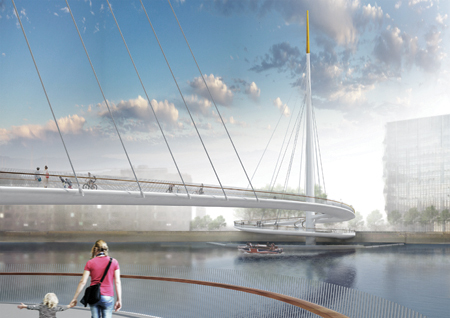 The jury of the Nine Elms to Pimlico Bridge competition has endorsed the concept proposed by Bystrup Architecture and Cowi team for a new bridge for cyclists and pedestrians over the River Thames in London. Pending final approval by Wandsworth Council's finance and corporate resources committee next week, the team will be selected as preferred bidder to develop a design for the new link. The team - which is made up of Bystrup, Robin Snell & Partners, Sven Ole Hansen, Aarsleff, ÅF Lighting Aecom, Cowi Engineering and DP9 - was chosen from four shortlisted proposals from an initial field of 74 entries. The winning team's concept design will not necessarily be built - Wandsworth Council has used the process to select a team, rather than a bridge design. The cost of the crossing is estimated at US$60 million.